I flew from Santiago to Punta Arenas and when I got there I immediately knew a chilean traveler, Nicolas (read the funny story about how it happened). 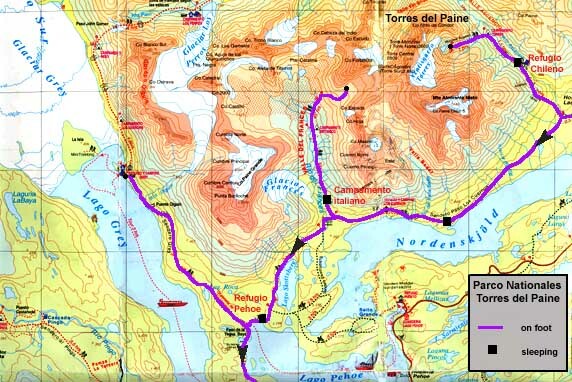 We decided to reach hitch hiking the entry of the Parco National Torres dal Paine. We got it in two days. I found it really funny but tiring too; most of the lifts were on the backside of the pick up and the road was unpaved, thus it was a very trembling experience. The first night we stopped in Puerto Natales and we slept in a military barracks. I liked this small town: my main memory are the kids playing everywhere who greeted me passing, and the suggestive raimbow I saw waking up after the rainy night. The day after we reached the entry of the National Park where we began trekking. It was quite tough since the heavy backbag, but in one day I get used. Me and Nicolas got perfectly along: he cooked and I prepared the tent. A kind of couple :-) We trekked several days in the park reaching also the amazing glaciar Grey and meeting some others travelers (see the map above). Then my time was over and I come back with an american couple while he went on. What you need depends strictly by where you'll go in Patagonia; if you are going to trek in the Parks in the north part or simply travel in the Tierra del Fuego, and overall it depends by the period you're going there. in the summertime (january-february) the daytime temperature is 12-18 C, but the sun rays burn and it's very windy. Moreover Patagonia is famous for the changeble weather due to the strong winds. It can start and stop raining getting clear severals time in one day. -The ferry in lake Grey that let you to nearer the glaciar didn't run because of the icebergs, despite it was summer. -There are not so many food store in the park, you need to be food independent for at least two- three days.